Strong leadership, clear focus and a pioneer spirit made that dream a reality. Read on to learn more about the formation of the Society and the fascinating people who have left their mark on it. The first woman to publish a paper in the Bulletin of the Seismological Society of America may be the most famous woman ever to have been a member of the Seismological Society of America: Lou Henry Hoover, who went on to become the First Lady of the United States. Because Lou Henry’s father had wanted her to be a boy, he gave his daughter a boy’s name and, at least in some ways, a boy’s upbringing. He took her camping in the hills of Southern California, where she developed an enthusiasm for rocks, minerals, and mining. She loved spending time outdoors and “didn’t mind being called a tomboy.” Herbert Hoover, her future husband, enrolled at Stanford University when it opened in 1891 and graduated with a degree in mining engineering. Lou Henry entered Stanford in 1894 and became interested in geology after hearing a lecture by Professor J. C. Branner. Encouraged by both Branner and her parents, she majored in geology, and in doing so became the first woman to choose that major at the fledgling university. She graduated in 1898 and, the following year, married Herbert Hoover. After their wedding, the couple went to China, where Herbert Hoover worked providing technical guidance to mining operations. Later, while traveling England, Lou Henry Hoover had the opportunity to meet John Milne, who was living on the Isle of Wight. Recognizing the importance of Milne’s contributions in the early days of seismology, she interviewed Milne and wrote an article describing his travels in Japan and his work with the Seismological Society of Japan. The article also described Milne’s pioneering efforts in seismometry and earthquake monitoring. Branner nominated Lou Henry Hoover for membership in the SSA on November 1, 1911; she was elected as a member two days later and her paper, “John Milne, Seismologist,” appeared in BSSA, Volume 2, Number 1, pages 2–7. She remained a member of SSA until her death in 1944. 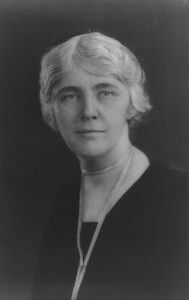 More information about Lou Henry Hoover is available on the World Wide Web at http://hoover.archives.gov/education/louhenrybio.html.